Fanorona (pronounced fa-NOORN) is a traditional game, played for the several hundred years in its present form. 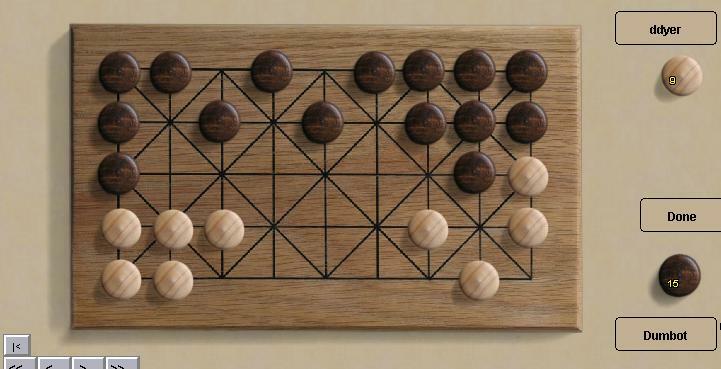 Fanorona starts are a fast moving capturing game - most of the pieces are typically captured in the first few turns. After the initial massacre, it becomes a subtle positional game. Fanorona is mostly played on the island of Magascar, and most of the explanations of the game are poorly translated, so while the official rules are available elsewhere, I recommend you read these rules, for clarity. Robots: The bots are very good at the initial capturing phase, but pretty bad at rounding up the survivors. The back story: I encountered Fanorona sometime long ago, but the feature that stuck with me was it's capture-by-withdrawal rule. It's so unusual (shared only with the "withdrawer" in Ultima Chess, as far as I know). So, when in a classical mood, I chose Fanorona for Boardspace.